Health information management graduates from San Diego Mesa College celebrate during commencement on May 19. Source: California Community Colleges Chancellor's Office. 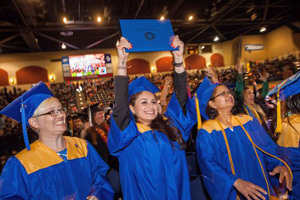 A pilot program formed in 2014 in California's community colleges just came to fruition when 135 students around the state graduated with bachelor's degrees from their two-year schools. The program's intent: to meet workforce needs where they're not duplicated at the state's public universities. By law, the "Baccalaureate Pilot" was limited to 15 campuses, nine of which began offering bachelor's degree programs in the fall of 2015. Each program was uniquely designed for colleges based on the workforce demands in a given region. The bachelor's degree in interaction design from Santa Monica College, which had 18 graduates, for example, is helping students prepare for jobs that blend the fields of design, user experience and technology. A respiratory care baccalaureate program at Skyline College, which had 20 graduates, will help replenish a labor force in which up to half of respiratory therapists are nearing retirement age. Those jobs pay an average of almost $76,000 annually statewide and above $90,000 in the San Francisco Bay Area, where the college is located. A week after San Diego Mesa College began its Health Information Management program (which had 16 graduates), Sharp Healthcare called Director Connie Renda "to collaborate in creating an employment pipeline straight from our college," she said in a prepared statement. Those job offers aren't anomalies, according to the California Community Colleges Chancellor's Office. At Bakersfield College, for example, five of the seven students earning a new bachelor's degree in industrial automation have job offers, and the other two have internships that promise to evolve into full-time opportunities. West Los Angeles College had the largest program results, with 29 graduates in dental hygiene. U.S. Veteran Guadalupe Flint was part of West's first baccalaureate class. While quality was an important factor in Flint selecting West, she told her college, program cost was also critical. At West she was "able to receive comparable training in state-of-the-art facilities" for about $20,000 compared to $122,000 for the program at the University of Southern California. The average student cost for the programs across the state is half of that — about $10,000 — "a fraction of what students are paying elsewhere," the Chancellor's Office said. Shasta College, with two graduates in health information management. Biotech at Solano Community College. "With this pilot program we are furthering the mission of providing tomorrow's workforce with the education and the skills needed to earn solid middle-class wages and realize the promise of upward social mobility," said Chancellor Eloy Ortiz Oakley. "We are proud of these graduates for breaking new ground and proud of all graduates at all 114 colleges who earned certificates and degrees."